Combined Engine Guard w/Highway Pegs! EG-1: Combining a stylish engine guard with built-in highway pegs, the Ergo Plus Engine Guard brings innovative design to the limits. 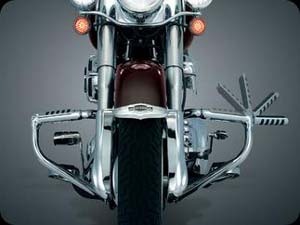 Use the highway pegs folded in or flip them out for an optional foot position! Designed with an ergonomic pull back, your feet will feel secure with less outward leg pressure no matter what position you have them in. 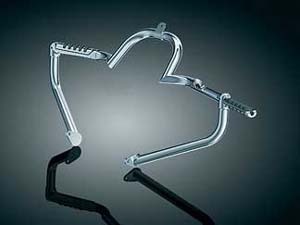 With a slick mounting system, the Ergo Plus Engine Guard bolts directly to existing mounts on your frame and does not use any clumsy universal clamps. 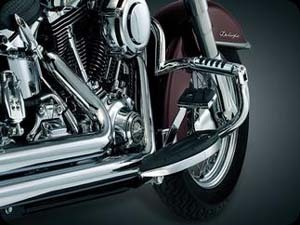 You'll be back on the road with your new engine guard and the comfort of multiple foot positions in no time. Fit's '97 to current Dressers and Road Kings (ex. Road Glide). EG-MB: With this simple bracket kit, you can easily install Silver Bullets (or any other lighting using 5/16" mounting screw). 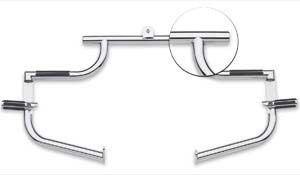 The kit includes two brackets and hardware to secure them to the existing holes beneath the foot rest area. The Ergo-Plus is already drilled to internally route the wiring for a neat adn clean appearance. 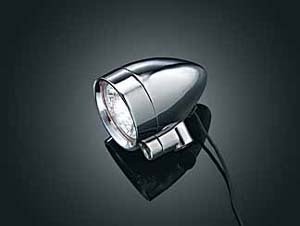 Note: If adding Silver Bullets to function as driving lights, we highly recommend using our Wiring and Relay Kit, P/N EG-2328. 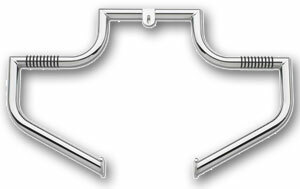 LB-102/106/109: Linbar for Dressers and Softail platforms. 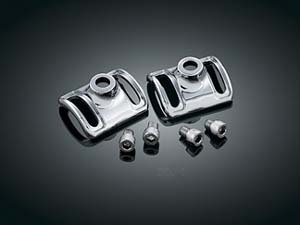 LB-1202: The TwinBar Flip Down Foot Pad. Engine guard with flip out foot pegs. 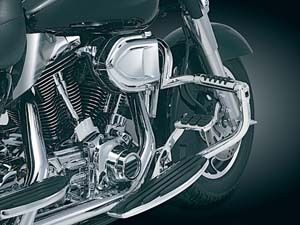 LB-1203: This TWINBAR part has an extended top tube for the Road Glide model fairing support. 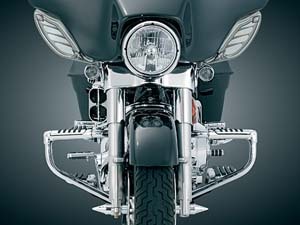 LB-1101: Harley Heritage, Deluxe, Fatboy, ,Softail Slim 2000-2013 (will fit 2012 models with ABS brakes).